City Meeting. 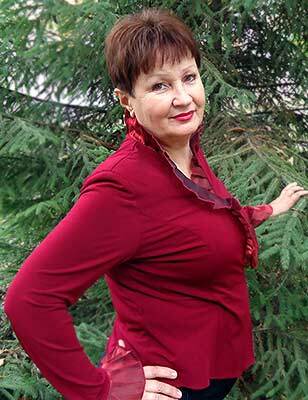 70851 Lyudmila Poltava (Ukraine) 66 y.o. I love to work at home and take care of the garden. I have a small garden where I grow flowers. I'm not afraid of getting my hands dirty, I like to work with the land. I also prefer to grow my own vegetables. I have a lot of free time, so I'm always looking for what to do. I love to swim and relax on the sea in Crimea. I lead an active life. Well, like most people I really do not like this part but here goes. I am a loving, caring, trustworthy, loyal and determined person. I am very independent and strong willed. I can be a little shy until I get to know someone, but I am very open and honest. I am family oriented woman, and I am a good mother. But I want to be a good wife too. I am sympathetic and good-natured. I easily find common language with everyone. I am a romantic and gentle, sometimes I can be too sentimental. The famous Russian poet Alexander Pushkin wrote "all ages are submissive love". And I think it is true. I am looking for a reliable man with same lust for life and interests. I am looking for an open, honest and sociable man with whom I will be happy. I want to enjoy simple things with beloved one.